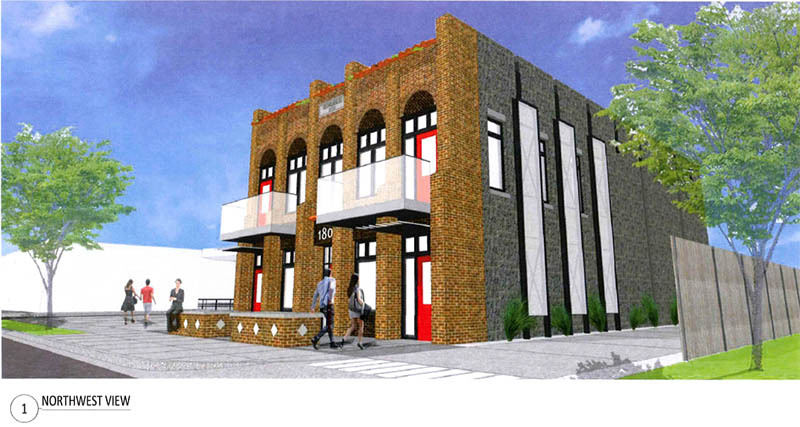 Plans have been submitted for a retail / commercial building in the Plaza District. 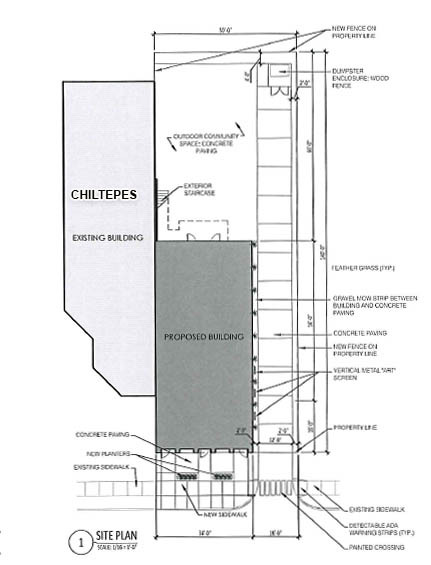 Developer Jeff Struble is proposing a 2-story structure on a vacant lot next to Chiltepes restaurant on the western edge of the district at 1802 NW 16th. Plans show retail or restaurant space on the first floor and retail or office space on the second. There would also be paved 'community space' in the rear. The Plaza has seen most of its main structures renovated over the 10 years. This, along with the proposed housing and retail project at 16th & McKinley, would be the first new construction in the booming area in quite a while. 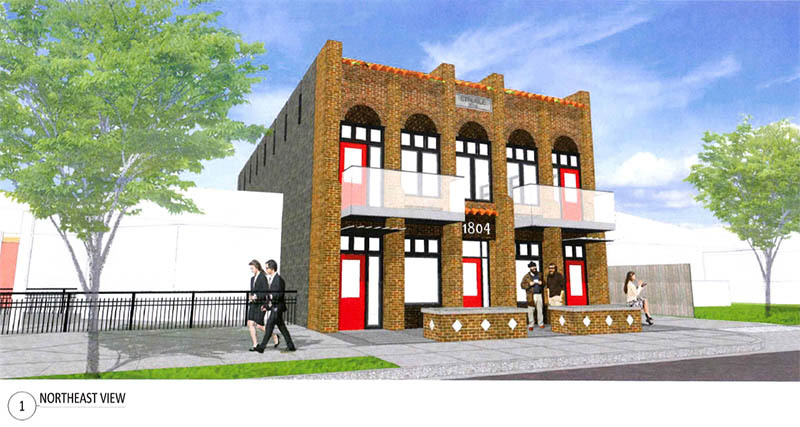 The building would be 4,796 square feet with a brick and clay tile main fascia. Struble has long been one of the leaders of the Plaza Renaissance, having purchased and renovated many structures, including the building that houses The Mule restaurant. Struble is also a past president of the Plaza Board of Directors. 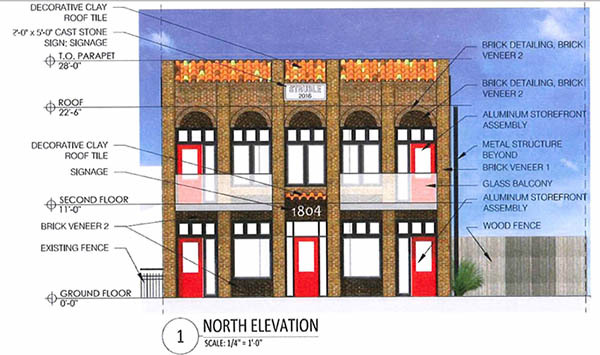 Plans for this new project will be reviewed at the December 16th meeting of the Urban Design Commission. Can't wait to see what about this will piss off the locals. Well, the project seems fine, but the pessimism is kind of annoying. Jeff Struble is pretty much the father of the Plaza District and has done a lot of projects in that area -- he also owns a construction company. He's built a lot of good will and strong relationships in the area and I'm sure he'll meet with all the stakeholders and homeowners if he hasn't already done so. The bottom line for new development in the Plaza is that this very important district is just out of space. It's as simple as that, and for now, the district has been prematurely "finished" by this fact. Indiana Center will get absorbed the day it opens. Plaza is something that needs a steady stream of new businesses because that's what it's known for and why people go there. I like it...not my money so if someone else wants to take a chance, sounds good to me. It would be cool if artists and entrepreneurs started buying houses along 16th street all the way to Classen for various businesses, restaurants, and bars. I'm sure there'd have to be some kind of zoning change or something, but that is a possible way the district could expand. Or maybe that's unrealistic. Something like a Rainey St. in Austin would be awesome with a more diversified group of businsesses. I'm not sure if the lots are big enough though, and they would certainly need a zoning change. I like the idea.... all leading up to whatever they end up developing on the old Herman's property. I've said many times in the Plaza thread that I felt Nob Hill in Portland should be the neighborhood that Plaza should model itself after. 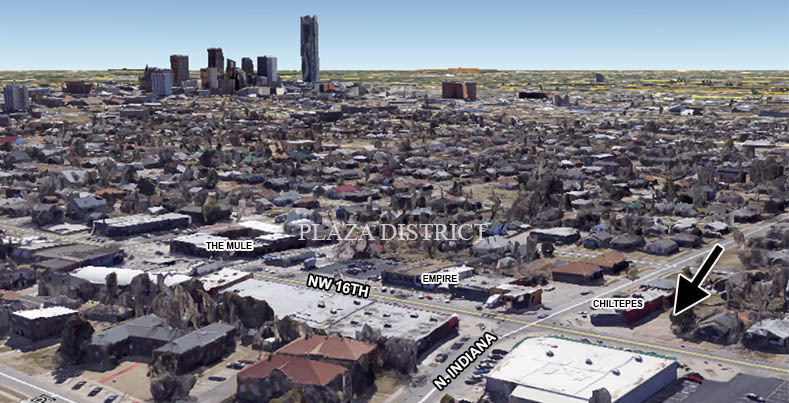 I think that the houses that front 16th between the Plaza commercial district and Classen should become shops, restaurants, offices and even a few of them B&Bs. The problem now is that values have shot through the roof, and I'm not sure it makes economic sense on a case by case basis to convert them as such. I don't know if the housing stock is wholly dense and interesting enough to make that work, but where it is we should preserve that. I think it will happen organically. I bet something like 23rd Street Courts will be done along 16th. I think it would be cool to add modern connecting pieces (like the Guernsey restaurant behind Cuppies and Joes) or shipping containers, etc. It's definitely interesting enough. Many of the houses look very similar to those in that picture. It's not quite as dense due to the presence of driveways and setback from 16th St., but I think it could probably work if they utilized the front yard space for several of the houses. The houses closer to Classen seem better for that kind of development but there are plenty of open lots for infill projects along 16th. Regardless of how, we 100% have to figure out how to "commercialize" 16th Street for the 5ish blocks between Classen and Blackwelder. If that area remains predominantly residential for the next 10-15 years, the Plaza will lose major ground on other Urban districts as time passes by. The driveways/setbacks/yards are what I'm thinking of though... Tough to overcome that. Totally agree with this. Would be really tough to create a sense of place on 16th street with the set up. Not to mention there are plenty of houses receiving investment to where I don't think you could create commercial fabric on 16th street east of Plaza. Now, I think west of Plaza the housing stock is primed for tear down or some kind of reuse. This building needs to be at least 50 floors or they shouldn't build it. If they're restaurants/bars, the areas work great as patios. And not every single house needs to stay. Keep some, raze some judiciously. Just make sure enough lots are assembled to increase density along the corridor slowly but surely: SE corner of 16th and College, for example, would be a great place to raze and build new. The setbacks on 16th are more narrow than people seem to think. About 15' to 18'. Install a 4'-6' curbside ribbon of grass with good street trees and great a 10' sidewalk and you're at the front porch. 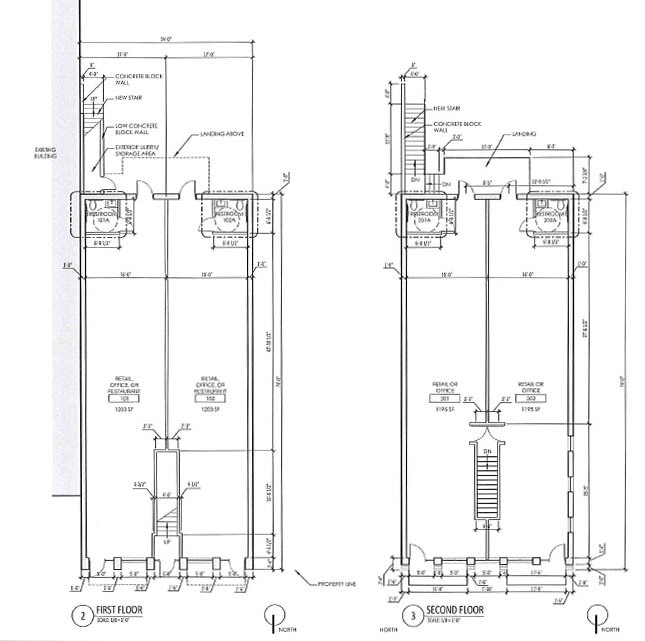 Added several new renderings to the article at the top of the page. I believe they are waiting on their building permit to be issued.